Further proof that mega-Star Wars fans have no boundaries, a man who recently and legally changed his name to Darth Vader in the Ukraine has been denied the right to run for president (which would be a better fate than Russia in my books, but hey, who's reading that?). 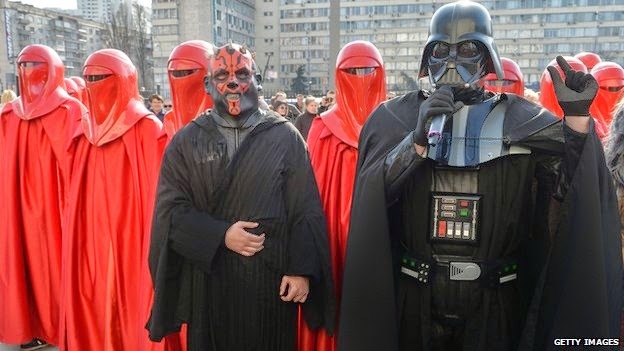 Nominated by The Internet Party of Ukraine, 'Darth Vader' only appears in public as the famous formerly fictional character, and at times even flanked by other Cosplay fans as well. Or are they? Me, I lost the bet. I always thought if Vader came to Earth he'd take Hungary first. They're never in the news about anything so they must be sleeping. Sleeping people = easy win. Rejected because his application was "questionable", if I was Vader I'd be preparing to give someone the choke stare. Not because of claims I forged application documents, but the fact I was shot down after forking out 2.5m hryvnyas (think $227,000) to apply. I'd have to sell my copy of X-Force #1 with the Deadpool trading card to raise that kind of cash, so I better at least get some TV airtime for that kind of sacrifice. What my X-Force #1 isn't worth that much? Okay, now I really need to choke somebody.